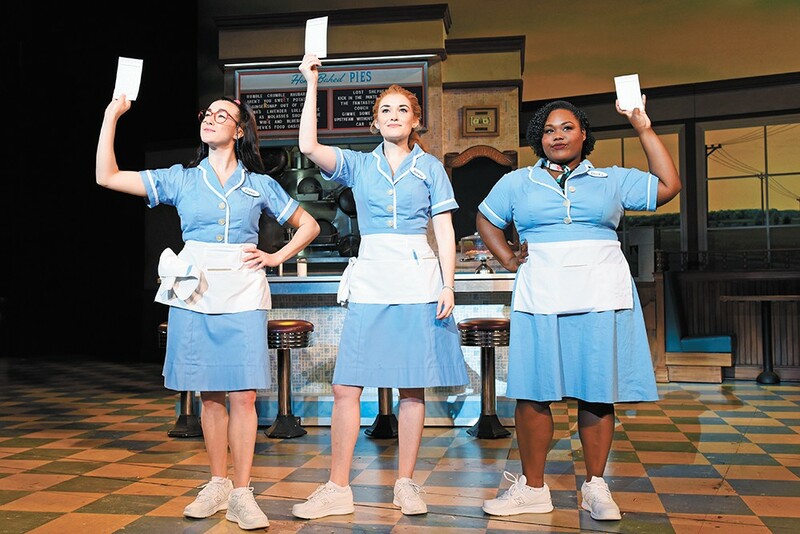 Christine Dwyer (center) plays Jenna, the lead in Waitress. Stepping into someone else's shoes is never an easy task, much less so when those shoes happen to be on a moving target. And yet, around the end of October, that's exactly what Steven Good had to do when he took over the role of Dr. Jim Pomatter from Bryan Fenkart in the nationally touring production of Waitress. The popular musical was halfway through its run. "This is the first time that I've replaced anyone," says Good, who joined Waitress not long after wrapping up the Jimmy Buffet-inspired musical Escape to Margaritaville on Broadway. "Most of how I learned the show was from watching Bryan do it. I would watch him from the audience, I would trail him backstage." Shadowing might have been a relatively new experience for Good, but it's not uncommon in the theater world, where the show must find a way to go on despite fairly constant changes in cast, crew and circumstances. His predecessor did the very same thing. "When Bryan was learning the part, he watched Drew [Gehling] do it, who was the original on Broadway," he says, "and I remember him telling me how it was frustrating sometimes because they were trying to get some of the exact same [comedic] beats that Drew had done. But Bryan is not Drew. He's his own actor." That highlights one of the trickier aspects of the theatrical shoe-filling process. It's one thing to learn the character's lines, choreography and blocking, even on a timeline measured in weeks, but there are some continuities that just can't be maintained. An actor's innate gestures and charisma — their presence, you might say — inevitably alter how we perceive their character. It also affects how we perceive their interactions with the other characters, usually summed up as chemistry, especially when those interactions have some romantic element to them. In the case of Waitress, based on the eponymous 2007 sleeper hit film, the impulsive, morally conflicted relationship between Dr. Pomatter and lead Jenna Hunterson, played by Christine Dwyer, is central to the story. After Fenkhart's departure, Good and Dwyer had to zero in on their own unique chemistry. "There's this scene where the doctor asks Jenna, 'So what seems to be the problem?' She says, 'Well, I seem to be pregnant.' And he goes, 'Ohhhhh,' and tries to give her a high five, which isn't the right response. So he has to kind of throw it away and pretend like he was just trying to swat a fly," Good says. Laboring the transition from the high five to the fly swatting seemed funny in rehearsals, but when it came to the actual performance Good had to subtly change his timing. Doing it "immediately" got a much bigger laugh. "It's comedy. So much of what you do relies on audience response. You just have to relinquish yourself to the fact that you just don't know what's going to happen until you get up on stage in front of people who are seeing this for the first time." Along with its comedy and romance, Waitress has become an audience favorite on account of its powerful, pop-inflected music. Written by singer-songwriter Sara Bareilles, songs like "Bad Idea" (describing Jenna's tryst with Dr. Pomatter) and "Opening Up" have resonated in unusually strong ways with theatergoers. "Sara is an incredible artist who has her own specific style," says Good, a singer-songwriter himself. "In her songwriting, she imbues the music and the lyrics with so much of her own heart and her own truth. I even find it difficult to put my finger on it, to explain why it's so good, because it's so complete, so whole. She was driven by the people and telling their stories." That completeness and those all-too-human stories, he says, are what makes Waitress itself "such a special show" with "musical theater moments" that are rich and multilayered. The original print version of this article was headlined "Check, Please!"